Alongside a date, add your company logo or claim to your business stamp, create versatile stamps for personal needs in accounting our controlling. Be creative, you have enough space on this robust, reliable office stamp. 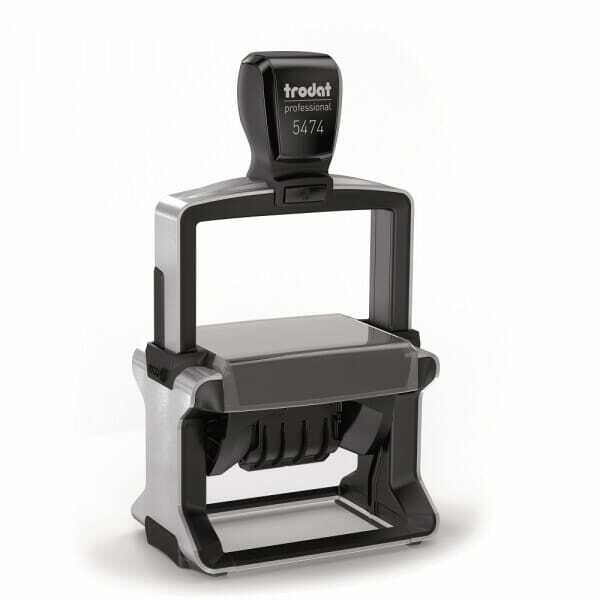 Trodat Professional 5474 is a self-inking rubber date stamp can include up to 6 lines of customised text, 3 above and 3 below the date. Creating a date height of 4 mm in an impression size measuring 59 x 38 mm. The date band includes date, month and 12 consecutive years. The date is easily set by turning the date bands, creating an impression of blue text and red date. Should you require an impression of any other colour, replacement 6/58 ink pads are available in the following colours: black, blue, green, red, or violet ink pads. Dry felt pads are suitable for special inks. Customer evaluation for "Trodat Professional Dater 5474 59 x 38 mm - 3+3 lines"